Records released by Rise Above always promise a marvellous retro listening experience. The cult label from England recently started to re-release old rarities, but their main focus lies on bands that sound as if their music had been recorded forty years ago. This also counts for the genial Ghost from Sweden who were only founded in 2008 and present themselves now to the world with their debut Opus Eponymous. The names of the musicians have not been revealed by the label who thus furthers the mystery of the band’s origins. The organ intro sets you into the right mood for this album that couldn’t come across any more occult. The lyrics consequently deal with Satan and dark rituals. The music sounds like early heavy metal of the late Sixties. The band is rarely acting truly heavy, instead they put more emphasis to capture their audience with melodic and sometimes even hypnotic structures. 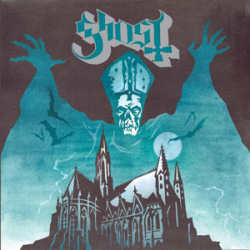 Ghost remind me actually of Black Widow who had quite an underground hit with Come To The Sabbat in 1970. Parallels to Mercyful Fate – minus the vocals – can also be made out. The band is never running short on ideas. Satan Prayer shows the band from their psychedelic side, Death Knell is flirting with the doom genre, and the concluding Genesis is an instrumental that also integrates acoustic instruments. The occasional bizarre choirs throughout the album also help to enhance the omnipresent mystic touch. Opus Eponymous is a record that couldn’t be any less modern but definitely has the potential to get every fan of nostalgia instantly hooked. The short playing time is the only annoying thing about this album which otherwise has all it takes to be considered one of the hottest hard rock / metal records of 2010.